Paramount Theatre Austin | Cancelled: Karamo Live! 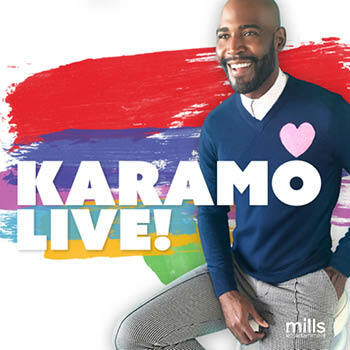 VIP 1 includes a signed copy of his book, Karamo: My Story of Embracing Purpose, Healing and Hope, as well as a meet and greet and photo-op with Karamo. VIP 2 includes a copy of Karamo: My Story of Embracing Purpose, Healing and Hope. The beloved social worker turned television-host, now turned author comes live to your city with the release of his first book ‘Karamo: My Story of Embracing Purpose, Healing and Hope’. Karamo has re-imagined the role of culture to go beyond the ballet and museums. As an openly gay, black man, a single father, and an activist, Karamo challenges audience members to consider how their shared labels, burdens and experiences have shaped the way they feel about themselves; and how they relate to the world around them—for this is culture as defined by Karamo. With a spirit of candor and an intention to inspire, Karamo will share insights from his life experiences. With sensitivity and encouragement, he will lead audience members through a conversation that broaches topics such as how to use your uniqueness to create success, how to leverage post-traumatic stress symptoms and creating awareness and change to make your mark in the world. Audience members are encouraged to come prepared to participate in the healing and conversation—this is not a lecture. This is Karamo doing what he does best—applying lessons gained through adversity to touch, inspire and transform the lives of those in need.